SureTrack®, the auto diagnostic resource in ProDemand®, brings together a unique combination of intelligence and expertise to help auto repair technicians of any experience level increase accuracy and efficiency from diagnosis to a completed repair. 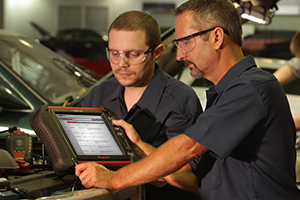 The industry’s most comprehensive source of expert knowledge for professional technicians, the SureTrack car diagnostic software combines real-world insights with repair time-savers and detailed parts replacement records. Build a diagnostic strategy with Real Fixes, Top Repairs, Causes and Fixes and more to reduce diagnostic time and increase accuracy. Look up a code, symptom, or component, and you get SureTrack information seamlessly integrated with OEM information as part of the exclusive ProDemand 1Search Plus feature. The unique card layout presents the exact information you need, aligned with the way you think about diagnostics and repair. Learn what has worked for other technicians like you. Access expert knowledge based on over 1 billion repair records covering just about every year/make/model combination you’re likely to see in your shop. Every system – from ABS to Transmissions, and more – is covered with shop-proven tips and test procedures. What is the root cause of the problem? With this exclusive SureTrack feature, you’ll see which repair procedures are most frequently performed to successfully complete the repair on vehicles just like the one in your bay. Quickly determine the most likely fix based on vehicle-specific model, mileage, codes, components and symptom. SureTrack is available to any ProDemand subscriber at no additional cost and is integrated into the 1Search Plus advanced search engine to seamlessly return real-world diagnostic insights along with OEM information with every lookup. In addition, SureTrack is fully integrated into several of Snap-on diagnostic tools such as Zeus, Verus, and Verdict (with a current Snap-on software upgrade).